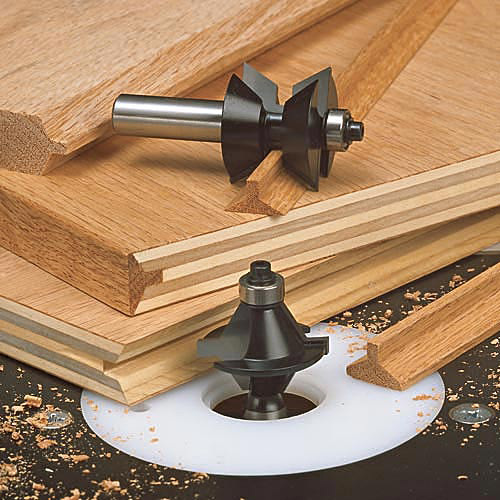 Put hardwood edges on your plywood, particle boards or MDF stock! Here is a simple way for you to make your own hardwood edge banding to finish off those plywood or MDF panels and shelves from 1/2" to 1" thick. Simply set the male groovers in your router table so that the center point of the bit is centered on the stock and make the cut. Now using the female grooves in your router table, set the height of the bit so that the center point of the bit matches the center point of the panel stock and then cut out the hardwood stock material. Glue the two pieces together and flush trim the edges if necessary. Two styles available. The 90° bit set (A) also makes horizontal v-grooves or double sided chamfers. The 60° bit set (B) features a tongue and groove design for a larger gluing surface. All bits two flute, carbide tipped, anti-kickback design with bearing guides, 1/2" shank. I cut over 60 feet of edging over the weekend. Using the edging bit was easy in my router table, ripped the pieces on the table saw next to it, run it through the router and back to the saw. However, plywood was a pain. It tends to tear out the edges of the ply. If you don't go deep enough into the edge, it leaves a gap when you insert the banding. If you go too deep then it tears out both sides of the finish veneers. So with some playing I found a "good enough" position. Also make sure you make the banding thicker than the ply by 1/16 or more on each side, since plywood is not exactly the same thickness I found that it would be off center and then short on one side and over on the other. So be prepared to sand sand sand to get a smooth seamless edging on both sides. Using upper feather board is a must to keep everything tight to the table. Good luck and hope to use this again on another project. A 1" 1-1/2" 2-1/2" 1/2"
B 1" 1-7/16" 2-1/2" 1/2"
Backordered until 5/15/2019. Reserve Now!